Now that we’ve safely surpassed our 100th review, we feel we’re finally fit to tackle Corrib Pub. Located just down the street from us, we had long written the Corrib off as the type of place our grandpas would frequent. Indeed, the beer and food were cheap, the taps shiny and copper, and the average clientele far past retirement age. Needless to say, we love us some old-school dives and were excited to learn first that they a) had nachos and b) that they’re $7. As a side note, they also have our favorite motto of any restaurant we’ve visited (“It’s like home, but with more taps”). Appearance: (7.5) Colorful, but lacking the depth provided by yellow saturated chips and cheese. Something about it reminded us of a child’s crayon drawing: there’s a lot going on, but it seems unfinished and sophomoric (okay, a sophomore with a solid 3.8 GPA). Quality of the toppings: (6) While we were impressed with the fresh ingredients (the tomatoes and onions in particular), the rest of the toppings left something to be desired. The overabundance of jarred salsa made it difficult to pick out other flavors, while the cheese was sticky and flavorless and the chips were a tad too salty. The chili tasted distinctly like taco seasoning (some of us liked it) and there was lettuce. To discuss our dislike of lettuce on nachos seems like beating a dead horse and we will instead refer to our friends at NachosNY for a full diatribe. Distribution of the toppings: (6.5) Something is seriously wrong with the Corrib’s cheese. Melting into a near solid on the peripheral chips, the innards of these nachos were sadly naked. There wasn’t enough of either the chili or the cheese, and the seas of salsa drown out the remaining ingredients. 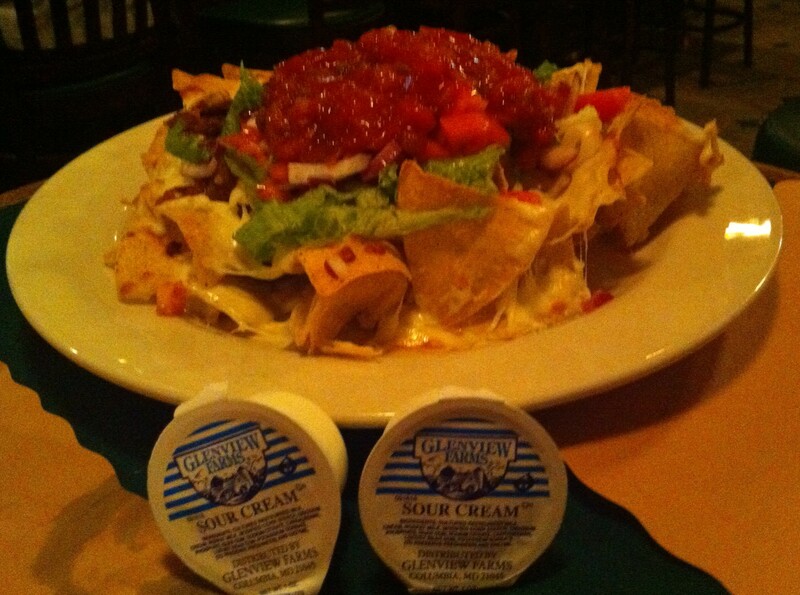 Sour cream was on the side, which was just fine with us. Price: (8.5) If the quality and distribution of the toppings brought the overall score down down, the price has to pull the whole plate back into the competition. $6.75 for a plate of nachos? Who cares how good they are–cheap prevails any day of the week. Overall: 28.5/40. Kinda of like the Narragansett of Boston nachos: cheap, local, old school, not that great, but will suffice in a pinch. Tags: Brookline, Coolidge Corner, Dive Bars, Futbol, Harvard Street, Irish Pub, Lettuce! Rawr!